In our last program, we told how the flow of immigration to the United States began to change in the 1880s. Before then, most of the immigrants came from central and northern Europe. From Britain, Ireland, Germany, and the Scandinavian countries. The largest number came from Britain. They found it easy to settle in the United States. They shared with the Americans the same language and many of the same traditions. Some of these early immigrants were skilled workers who found good jobs in American industry. Others were farmers who came to America for free land. After 1880, the flood of immigration from northern and central Europe began to fall. Now, most immigrants were coming from eastern and southern Europe. From Russia, Poland, Romania, Italy, Greece. American factory owners were pleased with the new immigrants. They gave them jobs formerly held by higher-paid American workers. 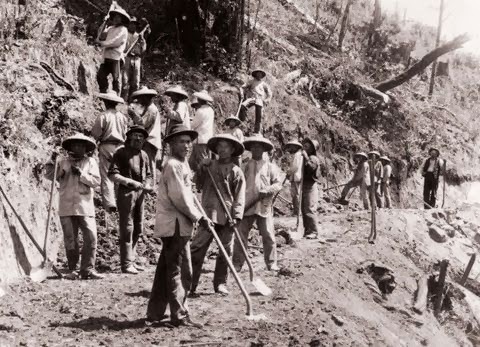 The owners asked the new workers to write letters to friends still in the old country, urging them to come to America. The protests were especially bitter on the pacific coast where thousands of Chinese immigrants were settling in California. The Chinese arrived there after 1850 to help build western railroads. After the railroads were completed, these Chinese new-comers turned to other jobs. More came every year. By the 1870s, California's political leaders were demanding an end to further immigration from China. In 1882, Congress passed a law that barred Chinese immigration for ten years. The law was extended for another ten years, then made permanent. The immigration law of 1882 put other limits on immigration. It closed the country to criminals, the mentally ill, and persons who could not support themselves. Later, others were added to this list. Persons with diseases. Anarchists. Alcoholics. "if we care for the welfare, the wages, or the standard of life of American workingmen, we should take immediate steps to limit foreign immigration. There is no danger to our workingmen from the coming of skilled workers or of trained and educated men. But there is a serious danger from the flood of unskilled, ignorant foreign labor. "This labor not only takes lower wages, but accepts a standard of living so low that the American workingman cannot compete with it." "A literacy test will bear very lightly, if at all, upon English-speaking immigrants or Germans, Scandinavians, and French. The races which would suffer most under a literacy test would be those with which the English-speaking people have never united, and who are most different from the great majority of the people of the United States." Another problem troubled President Cleveland. High tariffs -- taxes on imports. So, late in 1887, Cleveland sent a tariff message to Congress. Cleveland said he did not propose that all tariffs be ended. He said some were needed to raise money for the government. And he said some industries could not exist unless they were protected by tariffs. But he said tariffs should not let some industries make huge profits. The House of Representatives moved quickly to pass a moderate bill that would reduce many of the tariffs. The legislation -- called the Mills Bill -- was exactly what Cleveland wanted. But the bill ran into trouble in the Senate, where Republicans had control. The Senate debated the tariff question for months. And since it was 1888 -- a presidential election year -- the tariff became an important election issue. You have been listening to the Special English program, THE MAKING OF A NATION. Your narrators were Robert Bostic and Jack Weitzel. Our program was written by Frank Beardsley.